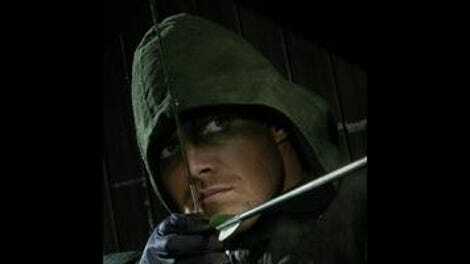 Let’s not kid ourselves: There was no way that Oliver Queen was actually dead. Actually, let me rephrase that. Given Arrow’s (not to mention The Flash’s) willingness to incorporate ever more fantastical elements, it is absolutely possible that Oliver really was dead for a while there. But there was never any real chance that Oliver was going to stay dead, as to write out the show’s title character—not to mention remove Stephen Amell, who has grown into the pitch-perfect lead for this ensemble—would represent maybe the single most absurdly gutsy (and gutsily absurd) move in television history. Oliver’s return was inevitable, and that more or less meant that Arrow needed to bring him back by the conclusion of tonight’s episode, because to pretend to leave that point in doubt would be counterproductive. But then again, it was only with that first flashback to Hong Kong that I remembered that Oliver’s death in the present day need not mean he has to be written out of the show entirely. I briefly wondered whether the show really might be about to keep Amell busy with a few weeks of Hong Kong-only work, holding off on a resurrection just agonizingly long enough that we might really begin to wonder whether Oliver was going to spend the rest of Arrow’s run hanging around outside that Hong Kong window, trying to break through the bulletproof glass. As it turns out, nah, the show did pretty much exactly what one might expect it to do—what the show’s larger narrative demanded it do—and brought Oliver back in the final scene. What makes this work, beyond the simple fact that I really didn’t want the big lug to be dead for any longer than strictly necessary, is that the episode actually incorporates the flashbacks into the story in a way that we haven’t really seen Arrow manage since Oliver escaped the island. Given this show’s Ra’s al Ghul appears apparent death, there’s likely no shortage of fantastical ways Oliver could have been revived, and I imagine next episode will give some specifics on that front. But tonight’s episode downplays the mystical mumbo jumbo and instead offers a straightforward, character-based reason why Oliver is still alive: Because, five long years ago, Oliver went far beyond the call of duty to help his friend Maseo save Tatsu, and in doing so he indebted the Yamashiros to him forever. Put more simply, Oliver proved himself a person worth saving, and so, when the time came, he was. After all the heartbreak and tragedy that he has endured, he has more than earned at least one escape from certain doom, and tonight’s Hong Kong scenes reinforce just how long that fact has been true. Back in Starling City, “Left Behind” explores how Oliver’s retinue copes with the looming certainty of his demise. Appropriately for the soap-opera strands in the show’s DNA, the severity of the reactions to Oliver’s apparent death are pretty much directly proportional to how much the individual characters loved him. Roy is clearly broken up over the loss of his mentor, yet he, more than anyone, comes into his own in the wake of Oliver’s disappearance, and not just because those two gigantic pipes finally provide Roy with a crime scene worthy of his parkour. Diggle is more outwardly emotional, at least by the standards of Diggle. 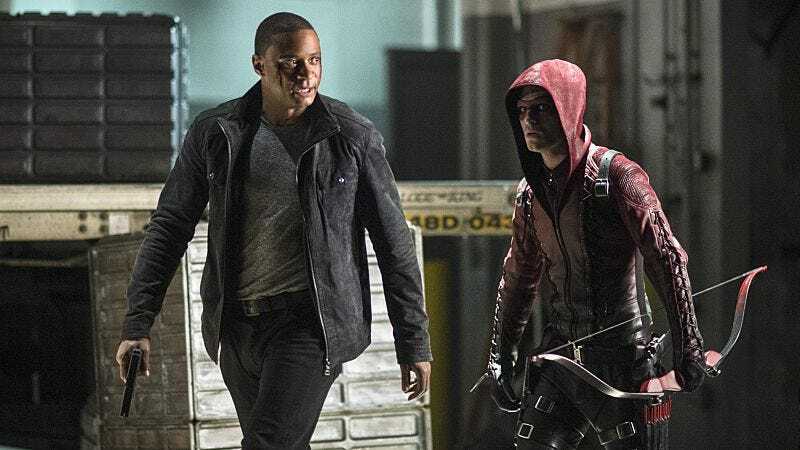 If I were being uncharitable, I might well say that Diggle’s observation that, for all that’s changed, he still thinks of himself as Oliver’s bodyguard, is something of an illustration of how much Arrow has struggled to give the character meaty material over the show’s run. But, as is often the case with the character, David Ramsay is able to locate the pathos in the line, using a light touch to convey that, in Diggle’s own quiet way, he is just as lost as Felicity is. Oh, poor Felicity. Arrow doesn’t do anything quite so programmatic as to have her explicitly work through the five stages of grief, but “Left Behind” offers a fairly close approximation of this, with Emily Bett Rickards doing some series-best work as the character gradually falls to pieces. With Oliver gone, Felicity essentially steps into the role of ”character unable to directly process her tangled emotions,” and this has the rather pleasant side effect of giving Ray Palmer a clearer role in the proceedings. Instead of just being the ceaselessly chipper boss who is always skirting the edge of being a massively inappropriate creep, Ray here instead shifts into being the recipient of Felicity’s confused, transferred emotions. The scene in which Felicity attempts to invoke the memory of Ray’s lost love to dissuade him from his plans, only for Ray to rebuke her in no uncertain terms, is a watershed moment for this sometimes odd pairing. It serves to refocus Felicity, to make her realize that she cannot enlist others as stand-ins or surrogates for her own feelings, and the scene also allows Ray to get deadly serious while making him more straightforwardly sympathetic than we’ve seen before. I mean, he still might be a total lunatic or a creep—though I’m hoping for hero!—but at least scenes like that offer a much better sense of the human experiences and motivations that led up to his possibly demented scheme. If you’re looking for the most direct possible proof as to how Arrow has evolved from its original conception to better suit the strengths of the cast, look no further than the fact that it’s Laurel who ends up comforting and consoling Felicity. Maybe the great comics-mandated love between Oliver and Laurel is still the show’s ultimate romantic destiny, but that point has never felt quite so far away as it does tonight. Make no mistake: Laurel isn’t right either, but she’s dealing with her latest round of emotional turmoil with what somehow counts as the healthiest approach in the Arrow universe, namely donning a superhero outfit and beating the crap out of some villains. And, to the show’s credit, the debut of Laurel’s Black Canary is actually fairly convincing. Katie Cassidy has bulked up for this more active iteration of Laurel, and more than that there’s a fluidity to her movement as the Canary that suggests Laurel might have at least some vague idea what she’s doing, even if her final attack with the staff understandably appears more fueled by raw anger than it does the technical precision of a real fighter. But what really makes Laurel’s official crime-fighting debut is the use of the Canary Call, something that Sara occasionally deployed but didn’t particularly need, so it was easy to forget what a serious trump card that technology is, and how far it can go in making Laurel at least halfway plausible as a vigilante. And Starling City sure looks like it’s going to need all the help it can get, especially if Oliver isn’t actually going to make his return until the episode titled, well, “The Return,” which is four episodes from now. (Then again, it’s possibly that’s someone else’s return. Expect a return in about a month, is what I’m really trying to say.) One-time Juggernaut and Guy Ritchie veteran Vinnie Jones makes an auspicious debut in “Left Behind,” playing the would-be Glades ruler Brick. Even at 50, Jones remains an intimidating presence, particularly given his apparent immunity to bullets. The proposition he offers his failed henchman (and later Diggle) is too comic-book cutesy, but Jones just about makes the gimmick work through sheer, fearsome charisma, and his final speech to his new army is far scarier than any monologue about mailing files to the police has any right to be. It’s hard to know quite what to make of Brick just yet: As an ongoing villain, it’s hard to imagine he can compete with the likes of Malcolm Merlyn or Ra’s al Ghul, or even the memory of the Mirakuru-addled Slade Wilson. But Jones brings a tough guy star power to the show that has the potential to elevate Brick to supervillain status. Like so much of “Left Behind,” this is Arrow in a bit of a holding pattern—an inevitability until Oliver comes home—but the new pieces on display bode well for the back half of season three. “You are right. And I will live with that guilt for the rest of my days.” Eh, I’m guessing Malcolm can manage. “You make it sound like using an advanced exoskeleton to fight crime and save the city is a Looney Tune idea.” Seriously, I still really don’t know what Arrow thinks it’s doing with Ray Palmer, but Brandon Routh is the best. “I guess arrows work a little better on this guy than bullets.” Hey, do you think it’s too early to start calling Roy “the Professor”? I feel like Roy would really enjoy it if people called him the Professor. “Dad, I could have killed you.” “Heh. It’s cute that you think so.” Malcolm Merlyn, father of the year, two years running!